We provide pre-marital and marital counseling, which may address the following areas/issues: compatibility and mate selection; communication skills; problem-solving and conflict-resolution skills; financial mismanagement; sexual dysfunction and complaints of sexual dissatisfaction or infidelity; jealousy; parenting concerns; problems with extended family members and former spouses; balancing career and family; adjusting to retirement and other life changes. While our primary commitment is helping couples improve their relationships, there are those who come to the decision that they must separate. 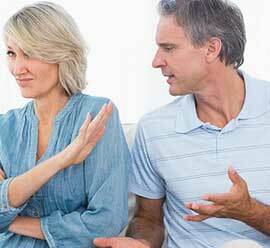 In these cases, we can help support couples through separation and divorce, with the goal of reducing conflict and minimizing legal/financial trauma, for the long-term benefit of all family members. We are able to supplement marital counseling with individual therapy, as needed. Note: Our practice focuses on the treatment of individual patients and sometimes this is facilitated by the participation of a spouse or other family member(s). In these cases, we include marital or family therapy as a component in the overall treatment of individual patients. Insurance plans do not cover any type of therapy, unless there is an identified patient with a clinical diagnosis. For couples who want marital therapy only, and when there is no identified patient with a clinical diagnosis, we provide marital counseling on a self-pay basis.